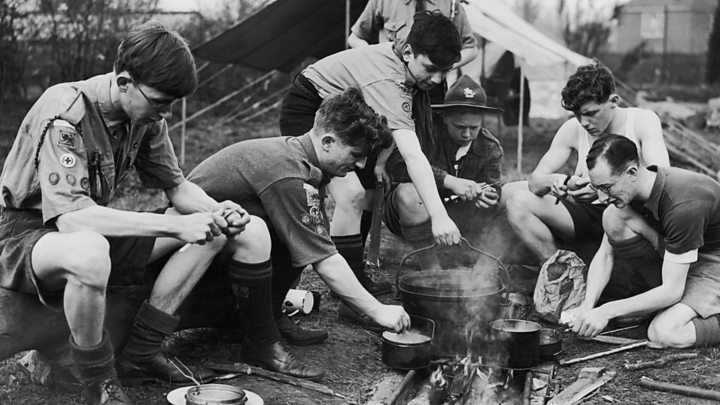 A shortage of leaders has left thousands of children stuck on a waiting list to become Scouts, Beavers, Cubs or Explorers, the Scout Association says. Here, two people to have donned the Scouts' woggle and scarf describe the ups and downs of being a volunteer. Lynn Dredge, who leads her local Beaver group for six- to eight-year-olds in Surrey, says she really enjoys her role. "You're able to do things you would have as a child but with your adult's head on - you still get that level of fun," she says. "We do sleepovers in the Scout hut and sing songs - all the old traditional things which the kids love. "Because we're a village I sometimes see old Beavers who are now grown up - they'll say 'Hi Kingfisher!' which is my scouting name." The 52-year-old, a teaching assistant in a primary school, has led the group for 16 years. She began as a parent volunteer after her son Stephen joined. Now, she runs a weekly meeting during term-time that lasts for an hour-and-a-quarter, and plans sessions with two other leaders. To organise this summer's term, "I met the other leaders at the pub and within a couple of hours we'd planned from now until July." Each weekly evening has a different theme, where children may be taught to tie knots, how to light a campfire or learn computer skills. And there are the trips. A camp-out on Dorset's Brownsea Island nature reserve and a jamboree in Holland where Scouts meet counterparts from across the world are on the agenda for Lynn's Beaver Scout Colony. "The adults are Scouts as much as the children," Lynn says. "If they go abseiling, or perform a talent show, we do it too - I'd never ask them to do something I'm not prepared to do myself." On the shortage of volunteers, she says parents often "love the idea" of their children scouting - but that they are rarely prepared to give their own time. "They forget that it's run by volunteers, week in and week out." She said some parents put their children on waiting lists up to four years before they are old enough to join, especially for oversubscribed groups. "A group in Ashford has to run two evenings a week, of around 20 children each, and there is still a waiting list," she says. "I've had to tell parents that unless you're prepared to help we won't be able to carry the group on." But she adds: "For the people who say that they don't have anytime to volunteer, I say, it's about juggling life." But with the activities come responsibilities. Training, health and safety rules and planning can be onerous, some leaders say. Jim Godden, 52, was a Scout leader in Bristol for eight years, but says he became "disillusioned" with bureaucracy by the time he left in 2015. "I was a very active Scout, leading a successful troop," he says. "We regularly went mountain walking, climbing, water-skiing, kayaking, biking and wild swimming, among many other activities." But it gradually became more difficult to authorise activities with senior leaders, he says, "even with the correct levels of leader ability and adhering to all safety factors". He adds: "The only way the Scout movement can really move on is to attract those people who already take part in adventurous activities." Jim says children want "adventure and excitement," rather than sitting at a campfire singing songs. He says some leaders are old-fashioned and "still see it from their 'good old days' when they were Scouts." For its part, the Scout Association said it was making it easier for those with limited time to join up by being flexible about how much time they can give and the sorts of jobs they do. It says they are responding to people wanting "much more flexible volunteering arrangements" than in the past. It said people could take up administrative and trustee roles, as well as being group leaders. They can help once a fortnight, month or term or at special events or camps. But this has to be balanced with training leaders, who with one other adult can be responsible for around 20 young people at a particular time. Everyone who signs up has a criminal record check and an appointment to assess if they are suitable for leading. After this, volunteers have five months to complete an initial training which includes essentials like first aid and leadership training. Once complete, they get a "Gilwell woggle" to show they are a learner leader. But it can take up to five years to finish training and get a Wood Badge - the recognised insignia given to adult scouters across the world. It looks like two wooden beads threaded onto a leather thong, and is modelled on a necklace given out by Robert Baden-Powell's at the first Scoutmasters' training camp in 1919. Lynn says: "It sounds like a lot, but you fit in learning over the weekend. We all enjoy teaching the children, but it's about us learning too."